Modern Milan, political capital of Lombardy and financial capital of Italy, conjures up images of sharply dressed business people, trendy fashion shows and elegant shops. Lombardy is one of the riches areas of Italy and, indeed, the world. So it may come as a surprise that the region’s traditional cuisine is actually fairly rustic, with many humble cucina povera dishes dating back to its less prosperous past. Many dishes revolve around staples like rice and polenta. Another case in point: minestra dei morti, or Soup of the Dead, a hearty, simple soup made with pork and chickpeas, traditionally prepared for November 2, the Day of the Dead or All Souls Day. The recipe for minestra dei morti originally called for pig’s head or, more specifically the tempia, or the sides of the head between the eyes and ears. All Souls Day coincided with the annual pig slaughtering season, and back in the days before refrigeration it was important to quickly use up those perishable parts of the animal. The pig’s head went into a pot to simmer with aromatics until tender; chickpeas were simmered separately until tender and then added to the pot for the last half hour or so. A bit like “La genovese” from Naples, the recipe for Minestra del morti gives you two courses in a traditional Italian meal. You eat the chickpeas and aromatics in the pork broth as a primo piatto, or first course, then the boiled pork as a secondo piatto, or second course, typically accompanied by pickled vegetables. Or you can break up the meat into pieces and serve everything together as a piatto unico or one-course meal. Either way, I think you’ll really enjoy this rustic soup—and maybe feel inspired to explore more of this regional cooking that deserves to be better known. Meanwhile, place the pork shoulder and bones in a large soup pot and enough water to cover. Add a generous pinch of salt. Bring to a simmer for a good hour, scrupulously skimming off any scum that rises to the top. Then add the vegetables, herbs and peppercorns and let simmer another hour or more, until the pork is tender and the broth has developed a rich flavor. Using a slotted spoon, transfer the chickpeas to the soup pot with the pork and vegetables. Let everything simmer together for a good 30 minutes to let the flavors meld. If you want to add some color, stir in some minced parsley just before serving. Serve the chickpeas with the broth as a primo piatto or first course, with freshly grated Parmesan cheese on the side for those who want it. Serve the pork as a secondo piatto or second course, accompanied by the pickled vegetables. While this is a pretty time-consuming dish, it’s a bit less so than back in the day. Older recipes call for soaking the chickpeas for 48 hours, followed by 2 to 4 hours of simmering. The chickpeas I used needed only an overnight soak and were tender after simmering 1-1/2 hours. I’ve seen some updated recipes that suggest using canned chickpeas, and I’m sure that would “work” but since the pork needs long simmering anyway, I’m not sure if you would save yourself any significant time or effort. The recipe for minestra dei morti in this post is based on the one proposed by the Accademia italiana della cucina. In some recipes you cook chickpeas and pork together in the same pot. For example, Allan Bay’s version, which he descriptively if rather mundanely calls minestra di ceci e costine (Chickpeas and Pork Rib Soup), calls for simmering soaked chickpeas and pork ribs together with a classic soffrito italiano, some tomato paste and (unique to Bay) a splash of white wine for three hours. Personally, I prefer cooking the pork and chickpeas separately. 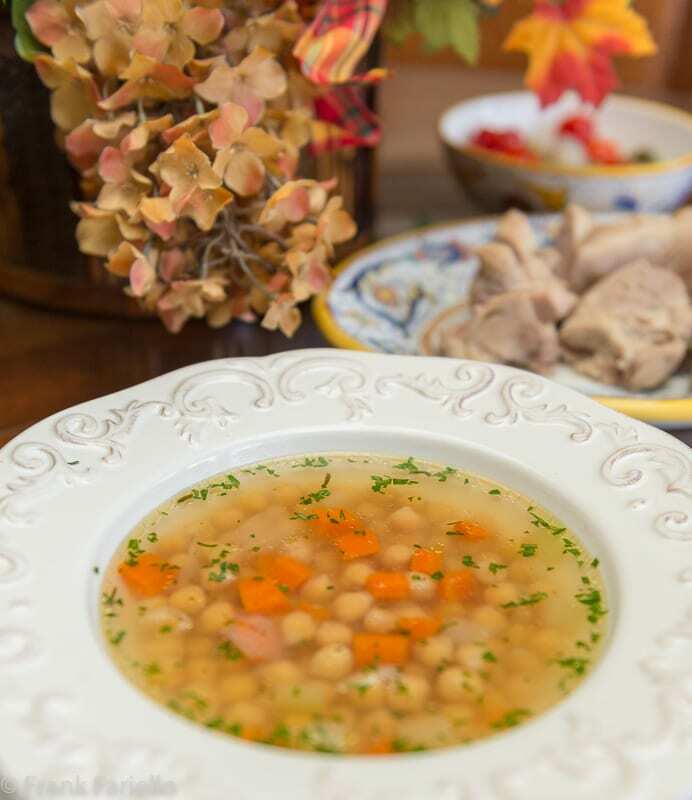 It produces a clearer broth and so a prettier soup, and you have no problems with either the chickpeas and pork cooking at different rates, as can readily happen since chickpeas are so unpredictable. In some recipes for minestra dei morti, the pork and aromatics are browned first in olive oil for extra depth of flavor, although I found this entirely boiled version, which I would assume is the original one, perfectly satisfying. I served with salsa verde along with the pickled vegetables to accompany the second course boiled pork shoulder. Pork is a very savory meat, and doesn’t need a spritely condiment as much as other boiled meats, but it was still very nice. As a contorno, we had sautéed spinach, which went perfectly. Alessandro Molinari Pradelli, in his La cucina lombarda, part of the Newton & Compton series of regional Italian cookbooks, calls this recipe ceci e tempia di maiale. He has similar but distinct recipe for zuppa dei morti, which he says is a speciality of Lodi. Borlotti beans are simmered for three hours with the usual aromatic vegetables, pork rind (cotenna) and pork ribs cut into small pieces. This stew is served piping hot over slices of bread and topped with Parmesan cheese, as much as you like. It does sound good. No doubt another dish to use up those less desirable pig parts, this time the rind rather than the head. This is so interesting about Lombardi. I’d love to explore more of Italy and have yet to visit Milan but find it fascinating that so much Cucina Povera comes from there. I am fascinated by all the different recipes in Italy (sweet and savory)to remember those that have passed. This is the sort of soup I like to eat all fall and winter…so comforting and hearty. It’s a wonderful tradition, isn’t it Lora? Wonderful, simple, delicious soup! It goes without saying that we did the same with pork here (slaughtering the pigs in the winter, usually closer to Christmas). Perhaps that is why bothe our peoples have lots of cured “deli” meats (smoked, salted etc) , to preserve the valuable pork for longer periods. We’re really looking fwd to trying this one out, pinned! I’d never heard of this soup until this post Frank. So warm and comforting, and perfect for a day remembering those long past. Loved reading all about the food history. I love learning something new and this soup is a new one for me. I don’t eat pork so I probably won’t try this but it sounds and looks beautifully rustic not to mention flavourful. I love how clear your broth is, Frank! Just beautiful! Thanks so much, Nazneen. And I bet this soup would work beautifully with another meat, especially lamb. This looks to be so similar to something Grandma made a lot during the NYC winters. I love long-simmering in the winter. It makes the home cozy. I will be making this when the MN chill comes (inexplicably, it hasn’t arrived yet). Soup truly does comfort me – even for breakfast. I feel the same way, Claudia. Seems we have been lucky weatherwise this fall. It just turned cold here. Trying this today. FYI, you mention peppercorns in the instructions but don’t specifically list them in the ingredients. Thanks for the heads up, Steve. Have tweaked the ingredients list. Made it today, Really good, pork was delicious, I didn’t have any pickled vegetables but I also made a quick Salsa Verde which complimented the pork really well. That’s awesome, Steve. Glad you enjoyed it. Your talk of the hog’s head brought to mind my accompanying Grandpa for the yearly fall purchase of a hog’s head that would be used to make head cheese. Although I’ve no way of knowing for sure, I bet a soup resulted, as well. He loved minestra di cece and our version was served on Christmas Eve, meatless of course. It just wasn’t our way, though, to discard bones of any kind before being used in a stockpot. So, I cannot believe that they would discard these once the head cheese was prepared. Well, I’m not about to go hog’s head shopping but I do want to prepare your soup, Frank. Thanks for providing the pork shoulder substitution. Your grandpa sounds like a man after my own heart. I’m a big fan of headcheese myself. Once again, Frank, something new to me! Your mention of the pig’s head immediately reminded me of the sheep’s head chapter in Jacques Pepin’s memoir. I have never had pork broth and, at your suggestion, will give it a try. Thanks David. I think you’ll like it! splendid dish & well researched post – thanks. I wanted to make this soup last month, but I could not find the tempia (I have never tasted and I am curious). It is a gelatinous cut and I thought I could use something similar, from the head, like cheeks. I have checked my books and I have found that this minestra used to be made also with pork ears and trotters. I take notice of your version now. In all my books the chickpeas and meat are cooked separately and then simmered together at the end, for half a hour. Allan Bay’s version sounds a little bit over the top (the soffritto, the white wine) and rather untraditional (although, I must say, the touch of white wine might make sense, to lighten the fattiness of the dish…??). I have seen also versions where cut up potatoes and shredded savoy cabbage are added. This would make for a thicker soup, but I think I prefer your lighter, more refined minestra, Frank. I agree wth Ian: re pressure cooker: chickpeas soaked in salted water for 12-24 hrs, then cook to perfection in around 10 minutes. Thanks, Stefano! I’ll try it next time with trotters and ears, which you can find in these parts in some ethnic markets. Sad to hear it’s a recipe that’s disappearing from restaurants. Hopefully the home cooks can keep it alive. non conoscevo questa ricetta , grazie per averla accompagnata con tante interessanti informazioni, buon we Frank ! Grazie a te, Chiara, per il tuo gentile commento. Buon weekend! The broth with a few vegetables, followed by the boiled meat & pickled vegetables with salsa verde – perfection! I use pork all the time in stews, chili, and ramen broth, but never in this sort of soup for some reason. My minestrone-type soups have usually been vegetarian, or included beef. Gotta try this! Sounds terrifically tasty. Thanks! Let us know what you think if you do try it, John! A delicious sounding recipe. You can cut down the time needed for this by using a pressure cooker, the new digital ones in particular, are very easy to use and a) allow use of a timer and b) switch off automatically after the cooking period finishes so can be filled and left while you’re off doing something else. I’m not sure there’s all that much advantage either in using dried rather than canned chickpeas. You could probaby do this in three stages: the first stage (15 minutes) for the initial cooking of the pork then second a further 10-15 minutes with the veg, then a final warm through (without pressure) of 5 minutes with the tinned chickpeas. I’m a big fan of pressure cookers. I have several stove top ones, but haven’t yet gotten on the digital bandwagon. When I’m feeling a bit flush I’ll give them a try. Your soup looks delicious and I am always fascinated by a recipe’s origin. I think knowing how it evolved makes it more special. I remember my parents talking about how All Souls Day was celebrated in Italy, much more so than here in the States. Even when I was in Catholic School it wasn’t stressed other than you had to go to Mass. Thank you for sharing! Have a wonderful Day!! You, too, Marisa Franca. I have to say I think that setting aside a day to remember and honor those who have passed from our lives is actually a lovely idea. It is a big holiday in many countries, but curiously not here in the US.